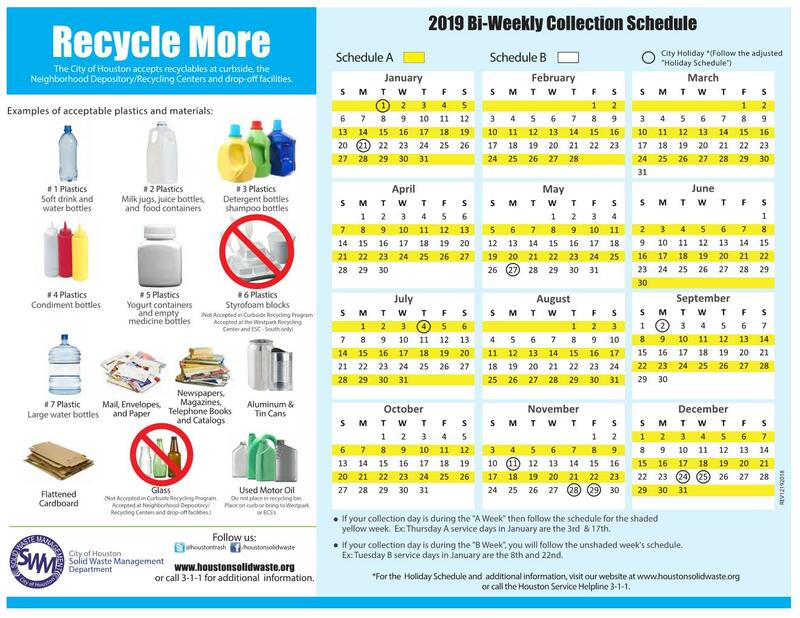 For a full description of your City of Houston Solid Waste Services, please go to: https://www.houstontx.gov/solidwaste/ and click on the link for TrashFacts. Regular Garbage is collected every Friday. Your 90-gallon BLACK automated garbage container should be at the curb by 7:00 a.m. and removed by 10:00 p.m. on your collection day. Recycling is collected every other Friday. Your 90-gallon GREEN automated recycling container should be at the curb by 7:00 a.m. and removed by 10:00 p.m. on your collection day. Afton Village’s heavy trash is collected on the fourth WEDNESDAY of each month. Odd months – Tree Waste Only. Even months – both Junk Waste AND Tree Waste accepted. Please leave at least three feet between the bins to allow the trucks to function correctly and do not place your bins under low-hanging tree branches. CARS PARKED ON THE STREET MAY PREVENT THE TRASH AND RECYCLING TRUCKS FROM MAKING THEIR COLLECTIONS. The City’s Heavy Trash Collection has been overhauled. In alternating months, residents may dispose of their Tree Waste, and Junk Waste at their curbside. This new method of collecting your large waste comes with the benefits of diverting materials that can be recycled from landfills, saving landfill space and your valuable tax dollars. 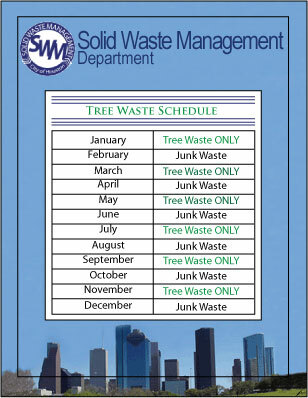 The Tree/Junk Waste schedule changes each month from Tree Waste to Junk. Tree Waste months are January, March, May, July, September, and November. Junk Waste months are February, April, June, August, October and December. “Tree Waste” is defined as “clean” wood waste such as tree limbs, branches, and stumps (lumber, furniture, and treated wood will NOT be accepted). “Junk Waste” is defined as items such as furniture, appliances, and other bulky material. Junk Waste may not be placed for collection during a Tree Waste Month. A maximum of four cubic yards of building material (not including brick, plaster or concrete) generated by the resident in connection with the maintenance of the resident’s property will be collected by Tree Waste/Junk Waste. Please Note: Tree Waste is accepted during Junk Waste Months. However, to ensure that your Tree Waste is recycled, you may hold your tree waste materials until the next Tree Waste designated month or bring it to a Neighborhood Depository.